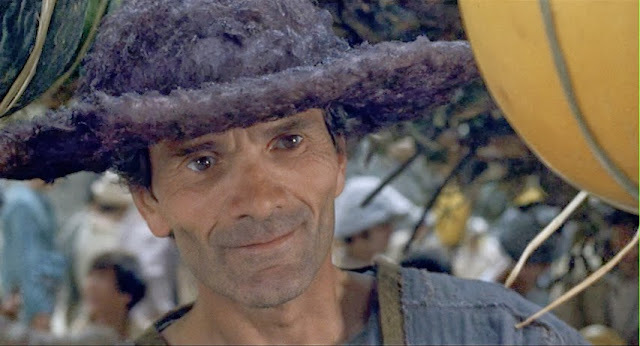 WHO: Pier Paolo Pasolini wrote the screenplay, directed, and took a small but significant acting role as the painter Giotto in this adaptation of eleven interwoven tales from Boccaccio. WHAT: One of Pasolini's most beautiful and entertaining films, and no less intellectually rich than the rest of his work. Fernando F. Croce's review is characteristically succinct and on point. WHERE/WHEN: Tonight only at the Pacific Film Archive at 6:15. WHY: It's the home stretch in the PFA's essentially-complete and nearly-chronological Pasolini retrospective. All that are left to play are the master's final four feature films, which in many ways represent the very peak of his cinematic creativity. His so-called "Trilogy of Life" consisting of The Decameron, the Canterbury Tales (also screening tonight) and The Arabian Nights (screening tomorrow at 5:00 PM) and his very last film, the justly-notorious Salò, or the 120 Days of Sodom which ends the series and the month on Halloween night. If you haven't used this retrospective as an opportunity to acquaint yourself with Pasolini's more infrequently-shown films, or to re-acquaint yourself with some you haven't seen before, perhaps at least you'll find it useful as an excuse for delving into the explosion of writing and link-collating that it has inspired in my friend Michael Guillén, who I was very pleased to be able to watch The Gospel According to St. Matthew with during a recent revisitation to Frisco Bay from his current abode in Idaho. Guillén has since written a tremendous article that serves as both personal reflection upon and critical review of that 1964 film. He also had published an interview he was able to conduct with frequent Pasolini star Ninetto Davoli, which includes some great comments on The Decameron and its legacy. This in addition to the six prior blog posts he'd published before our excursion to the PFA. Between reading his pieces and Barth David Schwartz's biography Pasolini Requiem over the past month and a half, I feel like I have a much stronger appreciation of the writer (a term of self-description Pasolini said he preferred over poet, filmmaker, artist, or any other) and his cinematic works than I would have just having watched the films, as wonderful as they are. HOW: The Decameron screens from a new 35mm print, just like every other feature film in the series.